Composition Each ml Contains : Analgin I .P. 500 mg. 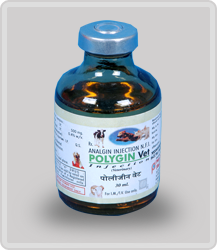 Dosage & Administrations : Large Animals : 10 to 15 ml. Small Animals : 2 to 8 ml. Presentation : Vials of 30 ml. Indications : For the relief of Pain in colics, lumbago like Complaints, Labour, Spastic, Condition of the orificium and Cervix during. Parturition, Rheumatic condition Neuritis, Neuralgia, Gastritis, in small domestic Animals and to prevent vomiting.